It was a long night in Algiers last night in a long week full of action. In case you missed the news from the Middle East and North Africa Tuesday evening, Algeria’s ailing president Abdel Aziz Bouteflika resigned from his position as the President after nearly 20 years of rule. His first Presidential term as the President of Algeria was on 27 April 1999 at the end of the Algerian civil war and he resigned from the position on 2 April 2019 after nearly a month and half of protesting demanding him not to run for another fifth time. 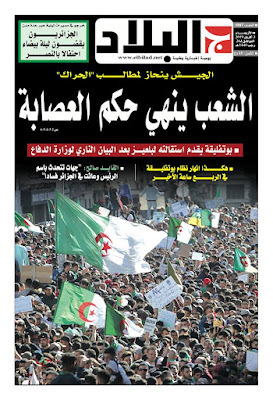 "The people end the gang's rule"
Bouteflika’s resignation came hours following an announcement by the Algerian People’s National army “that’s long name” Chief of staff Ahmed Gaid Saleh and the rest of the army that he should step down immediately. Sunday, the former Algerian president who suffered from a brain stroke in 2013 announced that he would resign before the 28th of April. 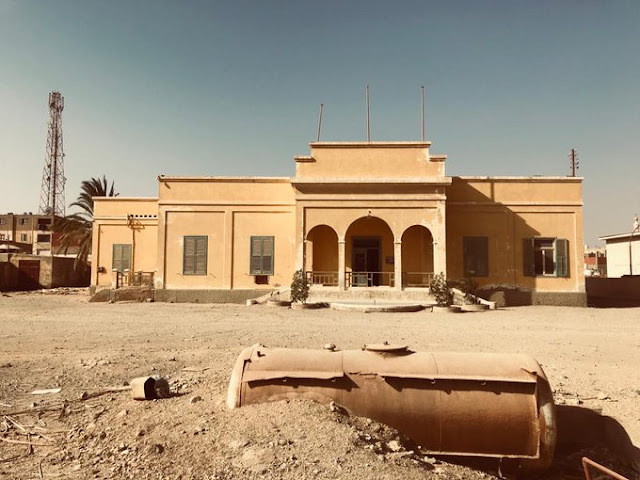 Things accelerated in the past four days as the businessmen class close to Bouteflika’s brothers who truly run the show began to fall down. The Algerians called those businessmen “Le pouvoir” which in French means those in power as well as “العصابة” which means in Arabic the gang. Some of those businessmen began to face arrests. 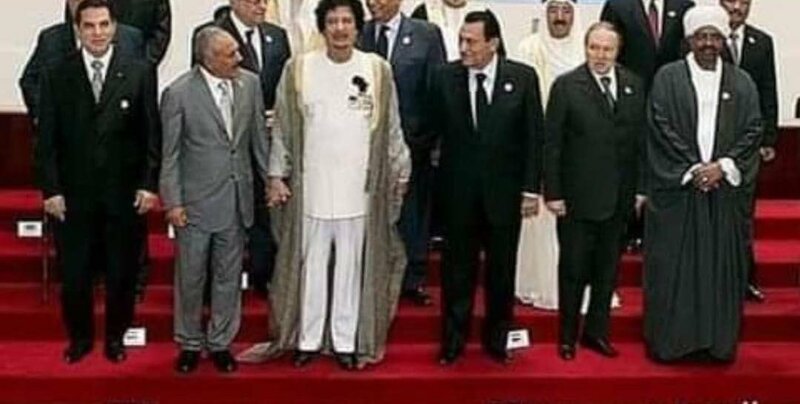 Ironically Gaid Saleh was considered one of the Bouteflikas’ closed circle but in the end, he sold them and chose the people. 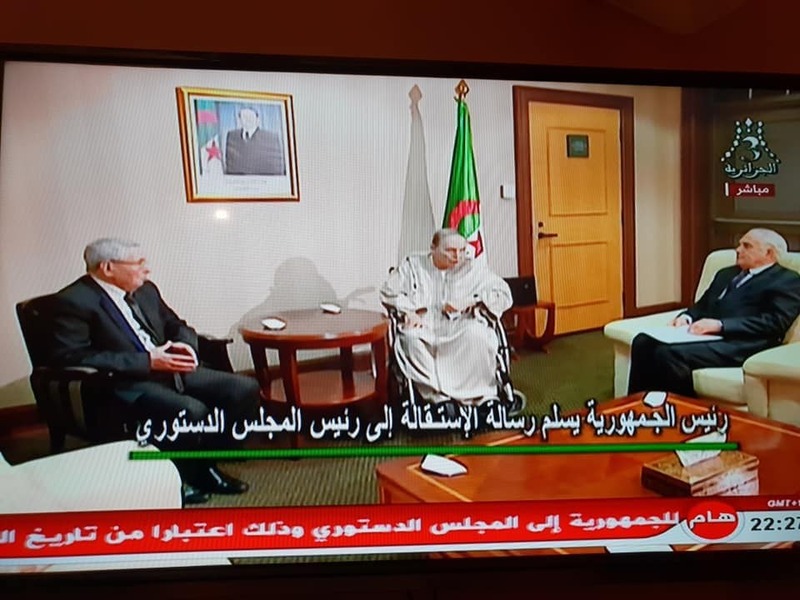 Anyhow on Tuesday evening, Bouteflika appeared wearing the traditional Algerian Kaftan on a wheelchair while he was presenting his resignation to the Constitutional Council of Algeria. I watch that video and I remember another video from 20 years ago where Bouteflika spoke on how “He was Algeria and Algeria was him”, that he was the representative of the Algerian people and that he was not a cookie the generals of the Algerian army can eat. Well, it turned out that the Algerian people did not want him to continue as their representative and the Algerian army chewed him and his cronies in the end. Since the 22nd of February, the hundreds of thousands of Algerians protested every Friday against the ailing president as well his regime demanding him not to run for another presidential term at the same time they demanded a new political system that would turn their country into a democracy. They began their protests while their president who suffered a stroke in 2013 that left him in a wheelchair, was in Geneva receiving treatment for some undisclosed disease. 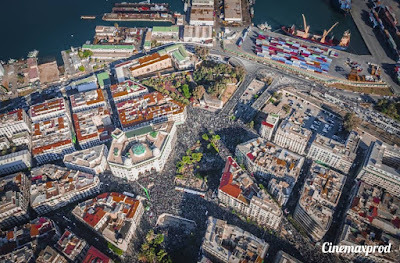 Every couple of weeks he presented concessions which were not enough for the angry public till the Algerian army took the people’s side and told Bouteflika enough was enough and it was time to leave the presidential palace. 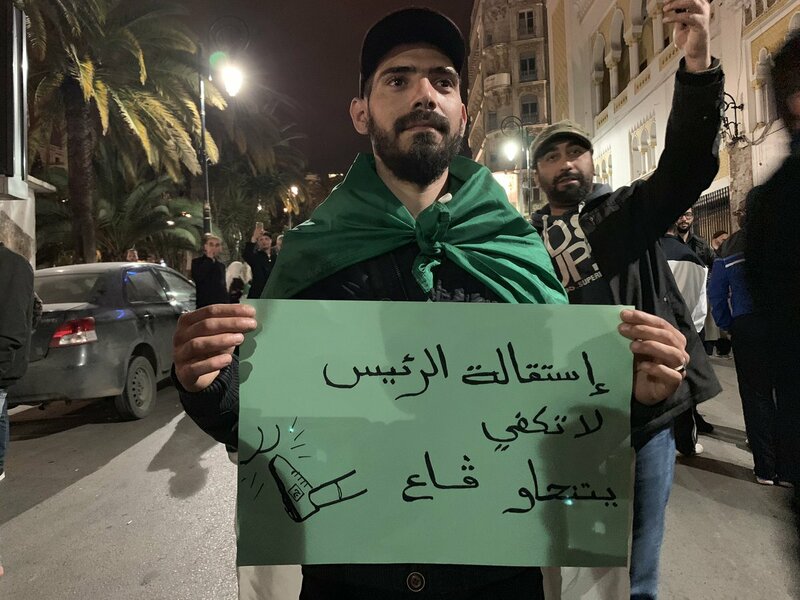 the hell out of our faces" said the banner held by that protester in Algiers on Tuesday "Khaled Drareni"
The Algerian army which is considered one of the main members of the Algerian regime made a clever choice to stand beside the people before things would evolve negatively. 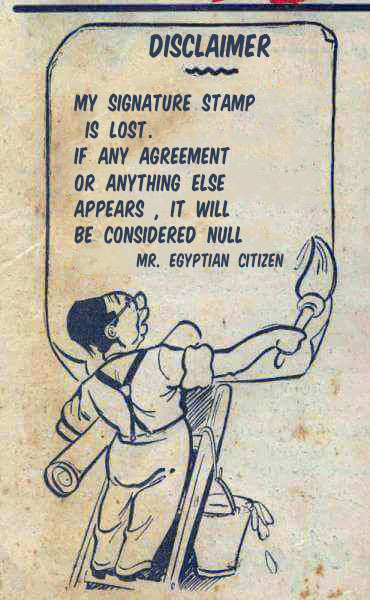 Now there is reasonable fear among Algerians that it would follow the Egyptian SCAF’s footsteps and I can understand why. Algerians did not sleep Tuesday night despite they have got one hell of a busy day on Wednesday. They are happy and they should be. It is a victory on their path for democracy. It will not be an easy ride though. 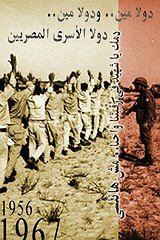 It is noticeable that many Algerians expressed online and offline their fear that Algeria would be dragged to an Egyptian scenario aka SCAF’s rule + Sisi rule in addition to their bloody experience in the civil war or as commonly known “The black decade”. 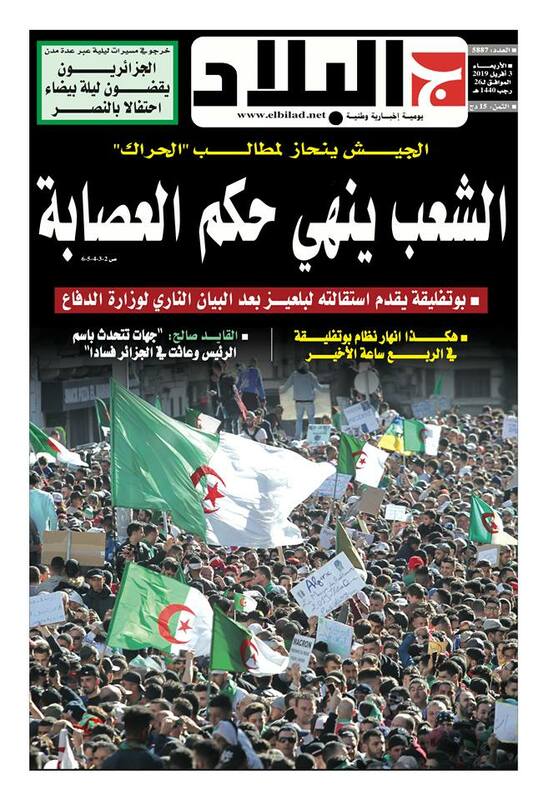 Time will tell if the Algerians have learnt from the past experience in the Arab Spring countries above them Egypt. 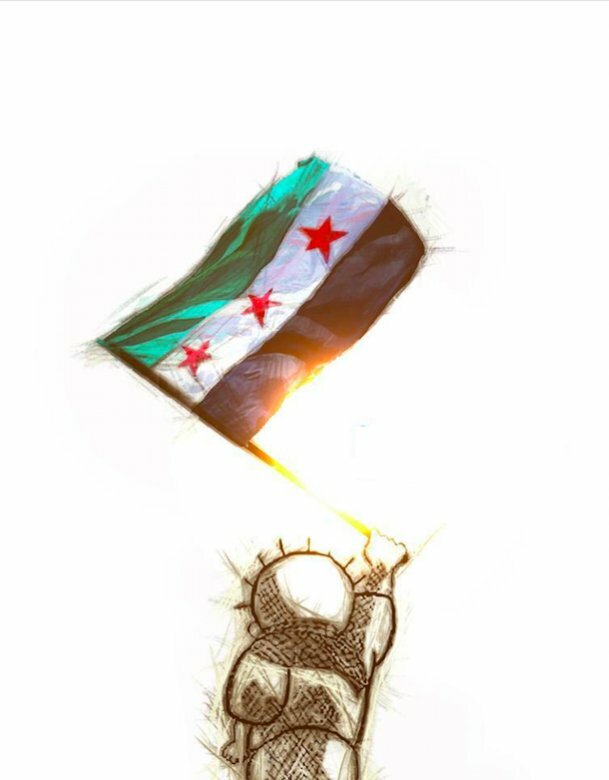 I wish and I pray from the bottom of my heart that they succeeded in what we failed in achieving , the Algerians deserve this because already they paid a huge price in the black decade.